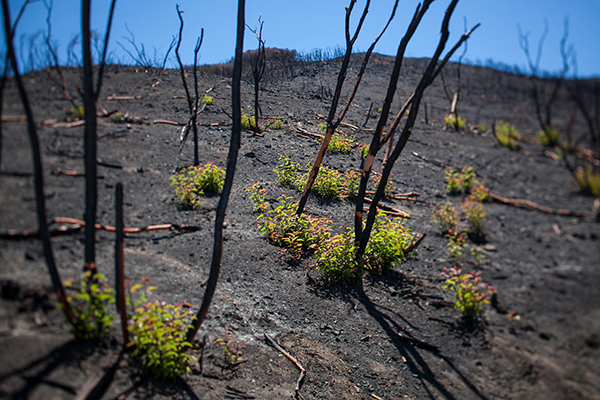 The 2013 Springs Fire in Camarillo destroyed 15 homes and 24,000 acres before firefighters and rain knocked it down. In the western United States, the season for wildfires has grown by 78 days since the 1970s. Over the last three decades, human-caused warming has nearly doubled the area burned. This article about the global climate crisis isn’t meant to scare anyone. However, since that’s hard to avoid, let’s compromise by pushing frightening information and dark thoughts down into footnotes (scroll down).1 Skip those if you’re inclined, but read on here, will you? This story is about the role of theology and religious belief in solving a global crisis, and about why some people, including graduates of Pacific Lutheran Theological Seminary (PLTS)2 and faculty members at Cal Lutheran, are calling the crisis a spiritual one. Only one piece of that strategy focuses on moving money around. “Not to invest in fossil fuels” means pulling some investments, influencing the behavior of public companies as a shareholder, and making positive new investments in industries like renewable power. More on investments below. Well over 200 volunteers representing dozens of organizations, mostly churches near Portland, have taught workshops or led their own community projects as a result. About 25 youth interns on small stipends have gotten involved, not only in Oregon but also in Wisconsin, Minnesota and British Columbia. Roughly half of all participants are Quakers, Episcopalians, Methodists, Presbyterians, Jews, Buddhists and others including non-religious activists looking to relieve their sense of isolation, according to Hartwig. 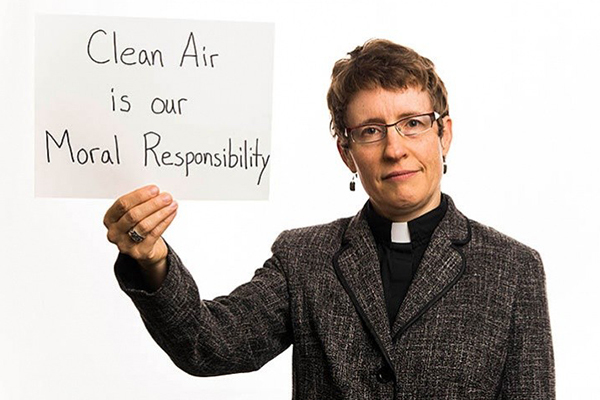 Robyn Hartwig joined a nationwide Earthjustice campaign in 2013 as a Clean Air Ambassador. The word recovery in the group’s name alludes to recovery from addiction. Hartwig saw herself as addicted to a way of life that was not sustainable for human beings or the web of life on Earth; and one of EcoFaith Recovery’s insights is that the change now required of us is change within us. At the same time, the volunteer-led group views the challenge as too big to be faced solely through the exercise of private, individual virtue. That’s why leadership development involves picking up the skills and screwing up courage to act publicly. Volunteers from an initiative called Beyond Fossil Fuels “go and organize their congregations to get active, whether it’s showing up at a city council meeting or a hearing for a proposed fossil fuel terminal, sometimes a march or a protest or writing letters,” Hartwig said. The organization is now calling on volunteers and their churches to dedicate a project in 2017 to Eco-Reformation. Like many people, Aana Marie Vigen, M.A. ’96, Ph.D., an associate professor at Loyola University Chicago, thought there would be more time to draw up plans for the climate fight. Were there not others, even in her field of Christian social ethics, who could speak to environmental issues while she focused on equally critical matters like public health and equal access to health care? Vigen’s teaching of undergraduate and graduate students has been transformed as a result. Even her medical ethics course on death and dying draws connections between ecological fragility and mortality, using climate change for context. She’s convinced that no specialist can ignore the problem and that every kind of worker from entrepreneur to entertainer is needed to address it. The climate issue 14 is not the first moral cause that’s prompted the ECLA to change how it invests and to offer new retirement fund choices to people working in its ministries. Portico, which manages roughly $8 billion for almost 27,000 individuals, offers eight social impact funds out of 20 choices. More than 30 percent of members put an average of about two-thirds of their retirement money into these funds to take a stand on social ills such as smoking, alcohol abuse, private prisons and the proliferation of guns. “If you sell your shares, you don’t get to show up at the table and vote. You lose that influence,” Thiemann said. Whether it’s the experience with innovation or with the ministry that he left a little more than five years ago in Walnut Creek, California, something tells Thiemann the climate crisis can and will be solved. 1 Along with some other stuff. 2 The theological seminary in Berkeley has been part of Cal Lutheran for almost three years. 3 The volume is expected from Cascade Books this November, in time for 500th-anniversary commemorations of the Protestant Reformation. 4 Not the most potent, but the most important of greenhouse gases in driving long-term temperature increases. 5 When Martin Luther was preaching, the atmospheric concentration of carbon dioxide stood at 280 parts per million. Now it exceeds 400 ppm and is unlikely to fall below that number in the lifetime of anyone reading this. 6 The assembly concluded while this year’s disastrous floods were coming to southern Louisiana. Climate models predict more intense storms in the future with greater precipitation. 7 Cal Lutheran is one of 26 colleges and universities affiliated with the Evangelical Lutheran Church in America (ELCA), and its seminary, PLTS, is one of eight that belong to the church body. 9 The ELCA had already endorsed the outcome of the Paris climate deal reached in December 2015 by international parties. Officially, that deal seeks to hold the global temperature increase to 1.5 degrees Celsius. 10 What’s wrong with more carbon dioxide? When gases trap heat in the atmosphere, the warming drives problems including sea level rise and longer periods of heat and drought. In another major concern, absorption of carbon dioxide is changing the chemistry of the oceans, endangering coral reefs and food chains. 12 The quote is from Vigen’s essay in the new Eco-Reformation volume, titled “Living Advent and Lent: A Call to Embody Reformation for the Sake of Human and Planetary Health.” It observes that climate change disrupts public health with “thirst, hunger and bugs”: contamination of drinking water, degradation of land and soil, and new habitats for disease-bearing insects, among other threats. 13 Cal Lutheran is in the process of developing its own carbon reduction goals after signing the Second Nature climate commitment in May.